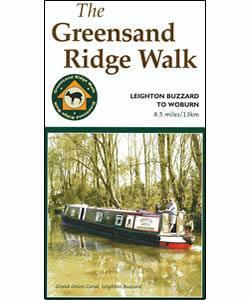 Greensand Ridge 1:Leighton Buzz'd-Woburn at Leighton Buzzard Walking RouteThe Greensand Ridge Walk is Bedfordshire's premier long distance walk. The route spans the county for a total of 40 miles, following the greensand ridge. The walk is an ideal introduction to the history, landscape and wildlife of this part of the county. Section 1, from Leighton Buzzard to Woburn, takes you through a variety of landscapes, from the calm of the Grand Union Canal, through historic Stockgrove Country Park, and finishes in the beautiful Georgian town of Woburn. Start/Finish Point: The route starts from the road bridge on Leighton Road in Leighton Buzzard and ends in the centre of Woburn, at the fire station on George Street. Start Nat GR: SP917251 Finish SP949328.